alaTest ha raccolto ed analizzato 60 recensioni su Sony SRF18. La media della valutazione per questo prodotto è 3.8/5, confrontata con la media della valutazione di 4.7/5 per altri prodotti. Abbiamo analizzato differenti valutazioni di esperti ed utenti, età del prodotto ed altri elementi. A confronto con altri prodotti, Sony SRF18 ha ottenuto un alaScore™ complessivo di 83/100 = qualità Molto buono. Preferable in its class. Good performance. Best product in class !! Design and quality is too good. Reception quality is great. Is compact and handy. Has Audio - IN and OUT feature which make it cool. Smaller than the pictures lead us to think. Good finishing and sound quality. Its good for my lovely lady (wife) to move from room to room. As we hate the site of people plugged in ears blasting their eardrums by music over the outside sound, this is best sight. A radio/transistor is hard to find in local stores. This one is remarkable. 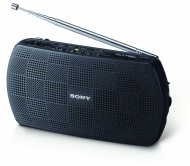 Plays AM and FM, has good quality sound. Is a constant companion at home. A wonderful gift. good. fits in pocket also.